'As a person and an inspirational speaker, Verity personifies the ability in disability by always pushing the boundaries of what is possible. 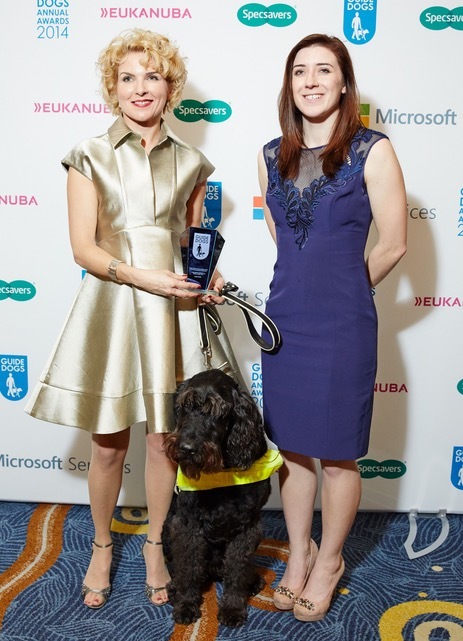 In late 2014 the Mail on Sunday readers voted her 'UK Inspirational Guide Dog Owner of the Year with Uffa, her Guide dog’. As a speaker, Verity has inspired, motivated, educated and entertained by her positive attitude. Through using real life experiences and examples, she encourages and persuades the audience to think about what can be achieved through persistence, determination, focus and most off all, humour. Verity is a successful and professional speaker, in both English and French who has presented at many prestigious ceremonies, corporate events and conferences. For further information and for all booking enquiries, please contact us. Verity Smith presented an inspiring and motivational keynote at The PA Show 2016 highlighting the ability in disability. Taking the audience on her journey Verity both moved and enthralled visitors with her antics and anecdotes and left them with no doubt that you can and you will succeed through hard work and determination. Seeing the world through Verity’s eyes opens up minds to realm of possibilities. Ingrid van der Weide | Event Manager | Mash Media – Olympia London.